How Much Does a Flat Pack Kitchen Cost? Flat Pack kitchens start at around $2000. 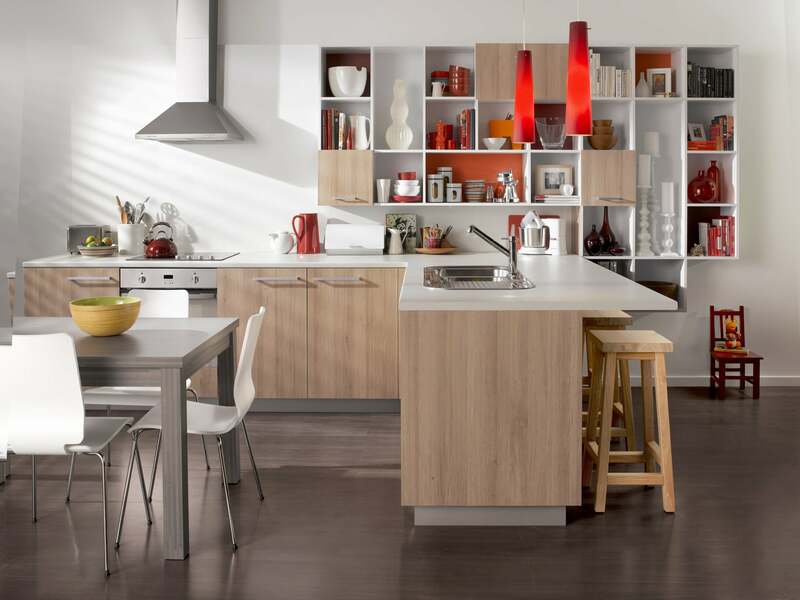 Our average kitchen with Formica doors & laminate benchtops are approx $4000 – $6000. Saying this it all depends on the size and materials used for the kitchen. Do the Online prices include GST? We purchase all our board from Australian Companies and manufacture all our cabinets on site at our factory in Caboolture. Indeed, every order is cut to size, to your individual measurements. Do the cabinets come with hardware? All cabinets and draws come with hardware. Excluding – Handles and adjustable feet or kick boards. Therefore you must order these separately. Are your cabinets and draws all soft closing? Yes you have the option to choose soft closing when you order. We mainly use BLUM hardware, but with your soft close choice you can use HARN or BLUM. In Addition we source quality products from our suppliers. Are the Cabinets hard to assemble? Our cabinets come pre-drilled and labeled. Anyone with moderate DIY experience can assemble the cabinets and kitchens. We recommend stacking the flat-pack component’s in groups of their relative numbers against a wall. This makes it easier to find each part when it comes time to assemble. Because our cabinets are made custom to your measurements to fit your space, hence you shouldn’t need a whole garage full of tools. Hole Saws bits (To drill holes for your water pipes, power points etc. Nevertheless if you don’t own these tools, ask a friend or relative, they may have some you can borrow. Yes we can make 16mm Raw & 18mm Satin MDF cabinets, doors & panels for you. You will find them in the Formica Range of colours under MDF. 18mm Satin is perfect for DIY painting as you can give it a light sand then etch prime and paint it. 18mm Satin board is coated both faces with a satin melamine finish designed to be painted. Can Quick Kitchens come out to design & install? What are standard cabinet dimenisions? Unlike a lot of flat-pack suppliers, at Quick Kitchens size doesn’t matter, but there are a few standard sizes that not only save you money but will make your kitchen work better too. In general the kitchen industry only work in millimetre’s (mm), hence all measurements on this site reflect. Height: is how high the individual cabinet is. Depth: is from the wall out. Width: is from one side to the other. Kickboard Height: 150mm for kitchens & 100mm for vanity’s. Base Carcass Height: 720mm depending on Benchtop thickness, gives you around the perfect benchtop height. Base Carcass Depth: 560mm is the normal size here, as it works well with 600mm benchtops. Therefore this leaves you with 20mm for the doors and 20mm benchtop overhang. Bench Height: 900mm from the floor works perfectly for most people. Wall Carcass Depth: 300mm works in most cases, you should purchase your range-hood first and make the depth suit it. Tall Carcass Height: 2150mm is a good height if your ceiling are 2400mm high. (yet once again you can order them different size to suit. What do all these Cabinet Making terms mean? To help with cabinet making terminology we have put together this short list of terms. These are sometimes referred to as floor cabinets. Can consist of a drawer, single door, double door, oven, open or corner. Sometimes referred to as overhead cabinets. Can consist of single door, double door, or open. Also called pantry or broom cabinets. Normally a whiteboard ladder frame base which sits on the ground that supports the carcass. Are sometimes used instead of a ladder frame kick base to support the carcass. These don’t tend to support the kitchen cabinet and benchtops as well as a properly constructed ladder frame. It all comes down to personal preference’s. Are the panels that attach to the kick base or feet to give you the finished product. The vertical end or side panel of a cabinet, these are manufactured as lefts and rights. As the name suggest these a the base of cabinet. These are use mainly in base cabinets instead of a full top. Can be a door or a drawer face. An engineered product made from woodchips which combined with a resin (Glue) is pressed into sheets of varies thickness. Is also engineered wood comprising of very fine sawdust and resin compressed also compressed into sheets. MDF tends to be a lot stronger then particle board and is mainly used for doors and panels. Is the thin layer placed over particle board or MDF to give it a high wearing, coloured surface. Pvc edge that is glued to the cut board to give it a finished look. Yes, we have a showroom at our head office. Unit 5, 39-45 Cessna Drive, Caboolture 4510. Open hours from 9am to 3pm Monday to Friday. However it is best to call for an appointment to make sure someone is available to assist you. Do I need a booking to visit your showroom? No, but it is recommended so we have staff to help you. Do you give Trade discount? Yes, we have a lot of tradesman we deal with. Though you will need to have a valid ABN and who are either a cabinet maker, carpenter, joinery or builder. Therefore please don’t hesitate to contact our office to discuss. We only deliver bench-tops locally – North Brisbane to the Sunshine Coast. Delivery is to ground floor only. You may need to have extra people on-site for assistance in lifting. We are working on a way of transport tops to other locations. Give us a call and we will see if we can help. Where do you deliver your assembled product too? We only deliver our assembled product locally – North Brisbane to the Sunshine Coast. Standard cost of $350.00 is for delivery approx. 1 hr radius from our head office at Caboolture. Delivery is to ground floor only. You may need to have extra people on-site for assistance in lifting. We can quote separately outside this area. Yes. You need to contact our office to arrange a pickup time during office hours. However please be aware that once your product leaves the factory it is under your care and suggest you make sure your transport company has transit insurance. ** Please be aware that you may need a couple of able bodies for loading your flatpack or assembled product. We do have a forklift on site for our flatpack product. What are the packing dimensions of your flat pack product? Our pallet dimensions are 2400mm x 1200mm. Though height is dependent on your order. Do you have depots outside the areas listed? Yes, we do have a few. You will have to email our office with your location and we can quote you a price. Does your transport company have insurance? Yes, we have up to $10 000 transit insurance. What happens if the items get damaged in transit? Before you sign for your product at the depot location, don’t forget to check for any damage!!! If you can see any damage, take photos and contact our office so we can get onto it straight away.IF THE CABINET OR CABINET ACCESSORIES HAVE BEEN INSTALLED WE WILL NOT ACCEPT THE DAMAGED CLAIM OR REPLACE THE CABINET. Do you have a minimum spend for order? Not for benchtops and Hardware orders. See below for minimum order spends for the cabinet ranges. Northside Kitchens is owned and operated by the owners of Quick Kitchens. Northside Kitchens is the trade name for the installation side of their business. If you have chosen a canopy range hood of any style, we can recommend the services of a Brisbane based company. C A RANGEHOODS installing all styles of canopy’s. Wall mounted, island style, cassette style, external motor, ceiling motor, Qasair brand, Sirius brand, Schweigen brand etc. DUCTING SERVICES AVAILABLE roof penetrations, masonry penetrations, plywood wall, external timber, soffit / eve etc. When ducting a range hood to the atmosphere there are a few things to consider. Secondly whether this style is appropriate for your needs and the design of your kitchen. It is important to research the volume of air you need moved. Cubic feet per minute (cfm ) or cubic metres per hour ( m3/h ). A range hood that is pushing between 400 m3/h and 800 m3/h is sufficient for a standard cook top. Also, noise factor is to be considered for the desired effect. You can look into how many decibels the motor will generate. 60 decibels is equivalent to conversational speech.